Most of us are still in the embryonic stage when it comes to makeup and lipstick but many of us "more mature" transgender or cross dressing girls certainly do remember a few of the women we admired from a distance. Just because we couldn't wear their lipstick, we certainly wanted to! The Revlon company just announced that in spring 2014, they will relaunch five of their discontinued iconic vintage shades. 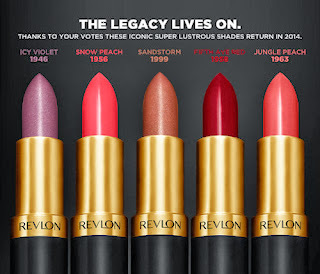 Revlon customers were asked to vote for the shades that they would like to see come back, via a Facebook poll. Here are the nominees and the year they were launched: -Daredevil Pink 1972 -Icy Violet 1946 -Revlon Red 1988 -Snow Peach 1956 -Sandstorm 1999 -Sphinx Pink 1962 -Baby Berry 1998 -Fifth Avenue Red 1958 -Persian Melon 1957 -Jungle Peach 1963 After several months of voting the results are in! Next spring, the following shades will be relaunched for a limited time only. Just think, a chance to relive a dream!